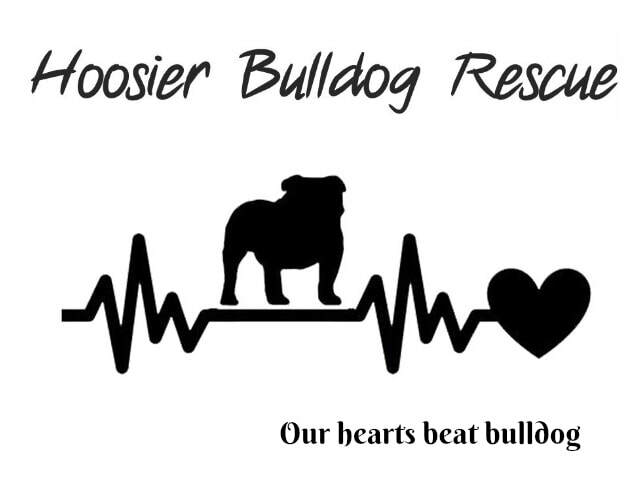 Founded in 2017, Hoosier Bulldog Rescue (HBR) is a small group of volunteers dedicated to helping English and French Bulldogs in the Indianapolis area. Our goal is to accept as many bulldogs into our rescue as we can, however we are very small so please understand our resources are limited. We accept bulldogs from animal shelters, puppy mills/breeder situations, as well as directly from families who are no longer able to provide care for their bulldog. To accept Bulldogs directly from owners who can no longer keep them, regardless of the reasoning. To accept Bulldogs from shelters in order to provide them with specialty care and placement that may otherwise be difficult for an all-breed facility. To rehabilitate Bulldogs through medical and behavioral intervention. To educate the public and potential adopters on the special needs of the Bulldog breed. To educate the community on responsible pet ownership. To assist people/families in keeping their Bulldog. Rescue is not only about rehoming dogs; it's also about keeping dogs in good families when possible. Congratulations to Daisy and Lola Bean on finding your fur-ever homes this month! ​We do NOT have a shelter facility. All of our bulldogs are cared for in loving foster homes until they are adopted by families who have been carefully screened for placement. If you would like to start the adoption process please visit our Adoption Page and fill out an application. View our AvailaBull Dogs. HBR relies on donations from the public to help provide necessary care to surrendered bulldogs. Many of the dogs we accept into rescue require extensive medical care that extends past the adoption fee. ​If you can help, please visit our Donation Page. ​We count on volunteers to make this organization successful. If you are interested in volunteering, please visit our Volunteer Page and submit a Volunteer Application. ​If you are looking to surrender your bulldog to rescue, please visit our Surrender Page and complete the Surrender Application.